It’s lightweight, tough and robust for operation in the field. We record direct to Apple ProRes or Avid DNxHD editing codecs onto commodity 2.5” hard discs at the camera, saving you on media costs, time for capturing and of course giving higher quality from any MPEG-based camera. Today’s camera sensors and lenses are quite spectacular, and we harness even large 5K+ sensors on professional video cameras to ensure you get the best from your camera - YES we support your make and model of Canon, Sony, Nikon, Panasonic, JVC, RED & ARRI. With all this crammed into a tiny fully customised OS, we give you all you need to produce – AC power, battery and charger, 2.5” HDD/SSD computer docking station - you will not believe what’s on offer! Designed using aircraft grade aluminium, the Ninja 2 delivers durability and portability. Locking mechanisms for each removable part means sturdy reliable operation. Weighing a mere 370grams the Ninja 2 is completely at home on top of any camera, whether in the studio or up a mountain. We don’t believe in jigsaw-puzzling a best of breed product, we have designed every circuit, coded every function and invested thousands of hours in testing, quality control, design and manufacturing. We do not buy standard IP cores like codecs, we do not lease HDMI/SDI interfaces – we write everything from scratch to deliver you a finely tuned thoroughbred video machine! Consuming just 6 watts of power – that’s nearly five times less than the nearest competitor - the Ninja 2 is perfect for battery-powered, in-the-field operation. Boasting no less than 4 power options, including the supplied NP series battery, DC power adapter for larger batteries, AC mains power and our patented Continuous Power dual battery system. You’ll never be without power when you need it most. (Canon and Nikon battery adaptors are now available. 2.5” hard disks are the most affordable digital storage on the planet. They outperform SSDs, SD card, SxS and P2 cards in terms of cost and reliability for video use. In normal video shooting environments the 2.5” HDD is your new tape. Extremely low running costs, long record times (up to 30 hours) and limitless supply. For those vibration sensitive shoots, around the racetrack or in the helicopter, we of course support modern SSDs. The AtomOS 4 operating system driving the Ninja 2 allows access to all functions through a fast and responsive touch-screen interface. SmartMonitor helps you accurately assess focus and exposure with focus peaking, adjustable zebra, false colour twin mode, blue-only exposure check and adjustments for individual filters. SmartLog allows you to get started on post-production in the field by logging and pre-editing your footage on the fly. The Ninja 2 records direct from the sensor giving you the best quality from your great lens and camera, no matter when it was made. Old and new cameras alike can get the benefit of higher quality recording, enhancing new cameras and breathing new life into older ones. Triggering record and capturing timecode in sync with your camera is essential to smooth production with external devices. We have teamed up with all the leading camera manufacturers, including Canon and Sony to give you frame accurate timecode and start/stop triggers over HDMI from popular HDMI cameras like the Canon C100, 5D MKIII, 1DC and the Sony FS700. So why record 10-bit from the sensor of a camera, if it's 8-bit? Well, if you want to edit, use CG or 3D effects, green screen or add titles and transitions, these will all be 12-bit or more. If you record 8-bit like most cameras, when the 12-bit or higher graphic is inserted into the timeline, the colours are 'crushed' down to 8-bit, making the result extremely poor quality. We bypass the 8-bit and record 10-bit colour registries to ensure your video plays nicely with all computer effects. Easy To Encode For CPU - Apple PRORES and Avid DNXHD! Editing codecs are made for editing video, not delivering video. MPEG is great for finishing and delivery – but not for post-production. We give you post-production quality recording on set. The codec choice we offer – Apple ProRes or Avid DNxHD – gives you universal non-linear editing support. Both are routinely used for film and TV production, as well as ProAV, event and independent film making. We have you covered, on Mac and PC. Using HDD up to 1TB means we can record high quality footage, free you from the hassle of changing memory cards and increase the quality of your footage at the same time. Using Avid 36 you can record up to 60 hrs on a 1TB drive! Flexible and affordable long and short recording, the adaptability you need in the field, on the road and in the studio. Safety First! Atomos File Recovery On The Fly! When recording the last thing you want is to lose the file you have been recording for the past hour, however if you pull the power or remove the disc, even though we have safety latches.. what happens? Well AtomOS is smart. It will detect the broken file from power outage or removal of disc mid record and reconstruct the frames and file to enable you to recover to within 2 frames of the catastrophic event. This is the peace of mind professionals need. All audio, even analogue audio, is locked frame accurately to every video frame, never drifting or losing sync. If the digital audio is out of sync from the camera you can even adjust this on the fly by advancing or delaying the audio coming in – very smart! With up to 2 channels of digital and 2 of analogue audio always available to view and monitor on headphone jacks or line out, audio is taken care of. From mixing desks and line out to XLR adaptor boxes like Beachtek and juicedLink, AtomOS covers all your audio needs. The Monitor That Thinks Its a Recorder & Deck! Professional monitoring – recording included for free! Probably the most surprising thing about AtomOS is that we can add functions traditionally performed by dedicated devices. Essential for creative set up and capturing the perfect shot – monitoring tools define how well you perform on the day. This means monitor assist functions to check exposure and focus are a must. With Ninja 2 you get focus peaking with multiple levels and colours for ease of use, false colour in two modes, zebra 0-100% fully adjustable and blue-only for that quick exposure check! Instant Shot Review Anytime Anywhere. AtomOS gives you speedy navigation, cutting and tagging on short and long clips with transport controls and finite frame-by-frame accurate stepping. Cut editing is time consuming and usually done in a studio by the people who weren’t at the shoot. AtomOS lets you rough cut your footage, tag it as Favourite or Reject, then save as a project, ready to finish and polish in the studio. This is a powerful time and money saver and helps collaboration on set. Export Apple ProRes or Avid DNxHD video with 16-bit audio from your choice of NLE and playback directly using AtomOS. View rushes from the edit suite on a portable, battery operated device that fits on your hand. Edit - Dock and Produce! From the original FCP to the current Final Cut Pro X, Adobe Premiere Pro to Autodesk Smoke, Sony Vegas Pro to Avid Media Composer, Grass Valley EDIUS to Lightworks. Our files are compatible with all major NLEs with no transocding required, and best of all, we work closely with them to bring more functionality all the time. 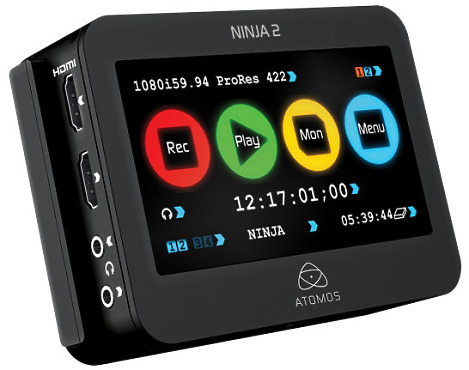 Hire the Atomos Ninja 2 from Procam. Best service and rental rates for the Atomos Ninja 2 and all cameras, lenses, sound, lighting and grip.